Dive Journal: I decide to leave the video camera on board this dive – this is a pleasure dive (ha ha). Another gorgeous Koraean dive. We see a nice pair of blackfin dartfish. Also a couple of fox-faced rabbitfish, another sleeping lionfish, and a few barred thicklip (wrasses). Speaking of lips, we also continue to spy the many beautiful painted clams with their wild purple lips. Linda particularly enjoys the patches of anemones and the collection of anemone fish and three-spot dascyllus that populate them. Katrina shows Linda how the anemone can be gently flapped up like a shag rug, and oftentimes the eggs of the anemonefish are visible underneath. Linda also enjoys stroking the anemone’s tentacles flowing back and forth in the surge – apparently she is not sensitive to their toxin like some people are. 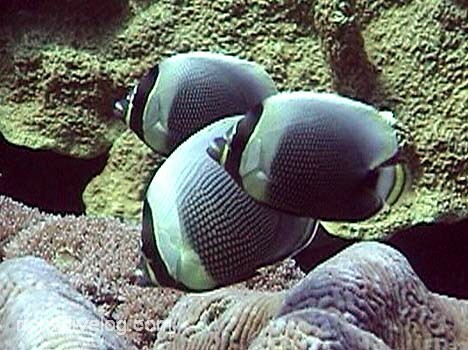 On exit there are some teardrop and spotbanded butterflyfish. We are getting better at identification by studying the Micronesian Reef Fishes book we’ve brought with us.